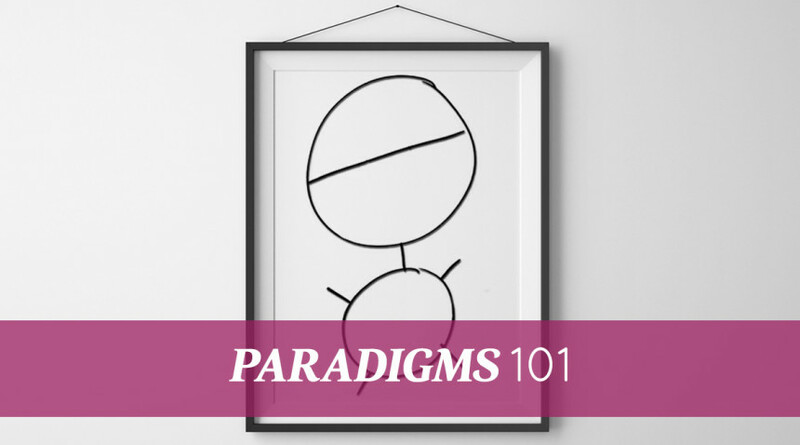 Paradigms 101 – What is a Paradigm? Did you know that, despite their best efforts, more than 90 percent of the population keeps getting the same results, year in and year out? This is as true for students in school as it is for people in business. If there is an improvement, it’s typically minimal—not nearly enough to make a substantial difference in their lifestyle. What’s holding these hard-working people back? A paradigm can be likened to a program that has been installed in your subconscious mind. It is a mental program that has almost exclusive control over your habitual behavior. When you think about it, virtually all of your behavior is habitual. When you get up in the morning and go to bed at night, you follow a routine. And the way you eat, exercise, work, relax and the time you wake up and go to sleep are all habits. The paradigm puts a box around each and every one of those areas, and no matter how hard you try, you can’t knock down the walls until you change the mental program. Although everyone has a paradigm, most of us don’t create it ourselves. We inherited it through our genetic and environmental conditioning. You were programmed, for example, by your parent’s and ancestors’ DNA, as well as many of their beliefs—going back for generations. Pretty much everything you were exposed to as a young child also became part of your paradigm. You see, when you were a child, whatever happened around you went right into your subconscious mind because you had no ability to reject anything. Any ideas that you were exposed to over and over again were like seeds being planted in fertile soil. They took root and became part of the paradigm that controls every aspect of your life. We’re not taught about paradigms in school. So here we are, 20… 30… 40… 60 years later living the same way we were programmed as little kids. Does your day begin with purpose and gratitude? Do you move through your day with laser focus or are you easily distracted, unable to finish anything? What’s the most money you have ever made in a year? Are you living the way you really want to live? If not, why not? Answering these and similar questions will help you zero in on your paradigm, and identify what’s controlling the results you are getting in your life. The good news is if you’re not happy with your results, and you’d like to do better, you can do something about it. You can’t change your paradigm with self-will alone. In fact, there are only two ways to do it. One is an emotional impact. That is when something hits you so hard that your life will never be the same. It’s usually of a negative nature, but it can also be something that is positive. The second way is to change the paradigm in the same manner it was formed—through repetition of ideas. It is exposing yourself to a new idea over and over again with the goal of replacing an old belief(s) that is in your subconscious mind. To get started, consciously choose a new belief that is aligned with the results you want and the habits that will lead you to those results. Then impress that idea—by focusing on it, visualizing it and repeating it with feeling—on your subconscious mind repetitively. You must also consciously and deliberately replace “bad” habits with good habits. Otherwise, you might form another bad habit to take the old habit’s place. Regardless of how many times you might have tried before, you CAN get far better results in your life. However, it’s tough to do without professional help. If you’d like to turn your deepest desires into lasting results, let us help you. It’s what we do best. Known as America’s greatest prosperity teacher and featured on the hit movie, "The Secret", formed with CEO of the Proctor Gallagher Institute, Sandy Gallagher, we believe most people want to earn more money, have more fun and enjoy their days more. But we know it won’t happen by accident. PGI’s teachings are built on the premise that we have a power flowing in and through us that is far superior to any condition or circumstance around us. We show our audience how to use their thoughts to direct this power to achieve whatever results they choose in this lifetime.